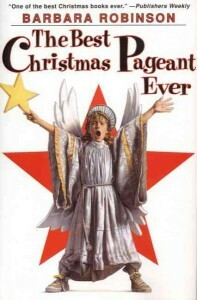 Dec 25 2012 Merry Christmas! Merry Christmas everyone! I’m still sick but not miserably so; my throat is fine and it’s just leftover runny nose, cough, and fatigue. The rest of the family seems to be nearly well. It just takes me a lot longer to recover. I’m starting to feel a bit better. Yesterday I was well enough to knit, and today my throat is a lot better and I’m coughing less. I’m still really fatigued, but at least I can make tea for Henry, who has caught the bug and is miserable. Poor lad. I stayed far away from him ever since I got sick, trying not to give it to him, but he got it anyway. Dan had it first (he brought it home from San Francisco) so now none of us have to worry about getting the others ill and we can all sit together cozily in the living room and recover. Ugh. I’m sick. I think I’ve got the flu. Started out a few days ago as just a mild sore throat but now I’m achey all over and so fatigued that I can’t even knit or read or watch movies. Little cough, stuffy head, delicate stomach, etc. No symptom is very dramatic but I still feel like I got run over by a moose or something. All noises are too loud. I felt really horrible all day but now at bedtime the achiness is a little better and I managed to watch a BBC documentary about Vikings invading Scotland. Not recently, hundreds of years ago. Why did the Vikings stop raiding the British isles? Miso broth is good when you’re sick. Hot and salty. A couple weeks ago a listener (Heather) suggested that I record a solo version of Charles Dickens’ “A Christmas Carol” so I did that :) Aravis was my MC and Proof-Listener extraordinaire. She did ALL the tedious LibriVox tasks and let me do just the fun part — recording! As usual, reading the story aloud made me notice things I hadn’t before. Did you ever realize that Scrooge’s nephew’s wife is pregnant? See if you can sniff out the delicate Victorian hints. 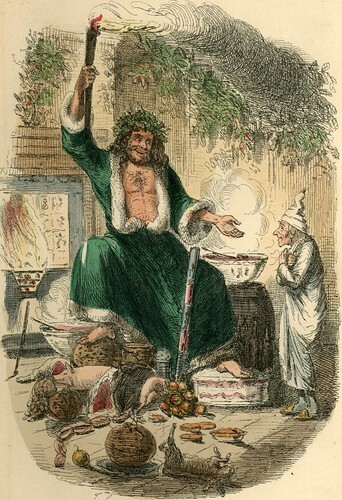 Hand-colored engraving of The Ghost of Christmas Present. This makes handsome album art!